Since summer vacation season is quickly approaching, LoveToKnow Dogs decided to have a chat with Camp Bow Wow USA to get a few pointers on choosing safe and friendly boarding kennels for our furry friends when they can't travel with us.Camp Bow Wow is a doggie day care camp that provides dogs with a boarding experience that is similar to sending your children off to summer camp. Dogs can come just to spend the day while their owners work, or for full overnights and extended stays. "Campers" take part in a variety of activities designed to keep them pleasantly stimulated. No moping in a concrete kennel for these lucky pets. Overnight guests even get to stay in their own private cabins. Although everyone is encouraged to contact the camp, not all are lucky enough to be accepted. Dogs must prove they can get along with the other campers in order to assure the safety and well being of all involved. CEO Heidi Flammang was kind enough to answer the questions we felt dog owners would most want to ask. Here are the results of our interview. Heidi, what qualities should pet owners look for in a dog boarding kennel? Owners should make a checklist with the following points, visit the boarding kennel they are considering and see how the establishment stacks up. What are some general warning signs that a kennel isn't a good place to leave your dog? 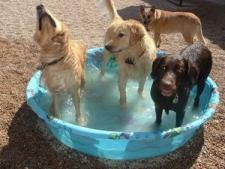 What requirements does Camp Bow Wow have for prospective canine clients? Tell us about your interview process. Once we verify the above criteria, the dog is placed in a controlled and monitored environment with three other well behaved dogs. If the potential boarder shows no signs of aggression or extreme submission, the dog will then be invited to a three-hour trial period where it remains under close supervision. If this trial period goes well, the animal is invited back for a full day of camp. What does boarding your dog at Camp Bow Wow cost, and what does the fee include? Costs vary by region, but average about $35.00 per overnight. This includes food, medication, campfire treats, and day camp. Any tips to make boarding your dog easier the first time? It is always best to expose your dog to new environments gradually. We encourage our boarding customers to bring their dogs to Day Camp a few times prior to leaving the dog overnight. This helps the dog become more comfortable with its surroundings and will cause less separation anxiety. It is also beneficial to leave a favorite toy or blanket with the dog to sleep with overnight. What is the most important thing you'd like everyone to know about Camp Bow Wow USA? We truly care about the dogs. Every product and service we offer has been introduced with the dog's happiness and safety in mind. We want our customers to know that their furry friends are in the best hands available, and that the dogs will likely have as much fun as they do on vacation! 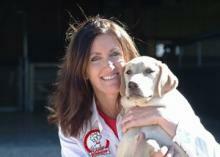 Many thanks to Heidi and Camp Bow Wow USA for answering our questions. No matter which dog boarding facilities are available in your area, hopefully you'll now feel armed with the knowledge you need to distinguish which dog day care will provide a safe and stimulating environment for your dog when you're away from home.